Situated in Borgo Ognissanti, historic district of Florence, this apartment is completely and tastefully renovated in 2015, offers the perfect alchemy for a pleasant stay in the city "Machiavellian" par excellence. 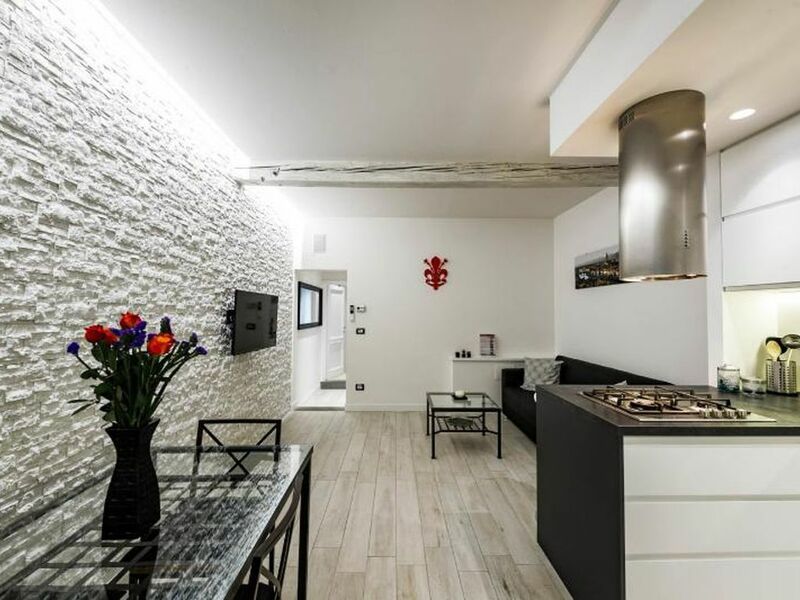 A few steps from Santa Maria Novella Station, La Dependance Machiavelli enjoys a strategic location, being only a 7-minute walk from the Duomo and all main places of artistic interest. Easily accessible for those arriving by car. Attention to detail, the apartment is located on the second floor (no elevator) of a small building. The very welcoming entrance, looks out from a part of a large and bright double bedroom, the other side instead opens onto a large living room / kitchen area where a beautiful stone veneer stands on one wall giving the environment one New Yorker loft style. The room is furnished with a table for 4/6 people, sofa bed, and LCD TV (42 ") and a soundlink bose for you to listen your favourite music. The peninsula kitchen is equipped with all comforts, oven, microwave, dishwasher, refrigerator and Nespresso machine for great coffee.Complete the apartment a bathroom equipped with every convenience including a double glass shower and a washbasin in Corian with back-lit mirror. All rooms are equipped with air conditioning, WI-FI high speed cable radio to listen to your favorite music and relax after a day immersed in the culture and beauty of Florence. My name is Pierpaolo and for the past fifteen years I have dedicated myself to welcoming tourists to our beautiful Florence. I always thought that the money spent in travel is well spent, and the feelings that pervade you when you know new places and people are hard to explain. Although by now we all live in a "global world" I still believe that essential human contact and make people feel at ease. That's why I decided to create this lovely apartment with the goal of not only welcoming guests but allowing them to experience true and proper "Florentine" culture. Although this is an apartment and does not have a true concierge service, it will still be my pleasure to take care of you, helping you to plan your stay, from your arrival, to booking individual visits or tours to museums in Florence, advising about local restaurants, and organizing excursions to nearby cities (Siena, San Gimignano, Pisa, and Cinque Terre), as well as the beauties of Tuscany and Chianti with its hills and its wines known throughout the world. Please feel free to contact me and I will be happy to answer your questions or provide you with additional information. The bathroom is equipped with every convenience including a double glass-enclosed shower and a washbasin in Corian with a lighted mirror. Beautifully decorated apartment in a great location. This is a modern clean apartment within walking distance from the train and a block from the river. It was easy to get to the center of the city yet nice to be away from the crowds. When we arrived there was fruit and a bottle of wine waiting for us in addition to some juice and bottled water in the fridge. There is a cafe below and we woke up to the lovely smell of baked goods.my husband enjoyed the espresso there and I loved the pastries. There was also a small grocery store a few doors down. Pierpaolo was a wonderful host and made us feel so welcome. His english was perfect. He gave us his contact number for any questions or problems and we did have to use it once when we had an issue with the lock box. He also helped us make reservations at a very popular restaurant. We rented a car and the agency was right down the road. It couldn't have been more perfect and is so much better than staying in a hotel. Thanks Pierpaolo. Dear Susan and Dale !! What a lovely surprize to receive your kind e-mail and to learn that you have enjoyed your stay in Florence and in my apartment. Dear Mike and Jim !! How wonderful to hear from you !! I am so happy to learn that you have enjoyed your stay in Florence and in my apartment. It has been a real pleasure to meet you and to welcome you in my flat. Borgo Ognissanti, which owes its name to the Church of All Saints, is a street full of shops and great restaurants (Italian and international), and provides a variety of large and small activities designed to satisfy every need. While Florence is a very quiet town, the presence of the police station makes Borgo Ognissanti a very safe area both day and night. Ideal for daily shopping, a Conad supermarket is right next to the apartment building. For the sweet tooth I recommend the bakery Becagli (also next to the apartment) where you will find every morning fresh bread, cakes, and great ideas for breakfast. In addition, across the street is the bar Blanco, a local very nice place for breakfast or a quick lunch. Going to Piazza Goldoni (shortly beyond the police station) I recommend the San Carlo, a very casual bar but also somewhere to enjoy drinks at the end of the evening (their drinks are excellent). Tired of so much culture? No problem! On Via Maso Finiguerra is the multiplex cinemas Marconi, always full of premieres. For those who want to enjoy a bit of pampering, I recommend the spa Javasun. Finally, but of primary importance, between Borgo Ognissanti and Maso Finiguerra are located all the most well known car rental agencies (Avis, Hertz, Europecar, Maggiore, etc.) that will allow you to rent a car for day trips or to continue your journey your next destination.